With the growing pace of technological advancement in the field of telecommunication, the potential risks are equally increasing with every new launch of advanced Android mobiles. Since each and every Android device is decked out with several features and applications for the user’s convenience. Those very features in time may turn out to be a source of havoc as well. For instance, your images, videos, music, movies, contact details, text messages, apps, games, all that your device contains can be a serious source of exploitation if fallen in wrong hands. Thus it is very much necessary to wipe your device of all the contents so that it can become suitable for handing it over or selling out to someone you know or don’t know personally. This article is introduced with 3 marvelous tricks which would easily help you to wipe out all data in case of emergencies. Continue reading the article below to get acquainted with the contents more. Step 1. Switch off your device and then switch it on by pressing together “Home + Power + Volume Down” buttons. Step 2. By pressing the following key combination, your device will enter the recovery mode. Step 3. 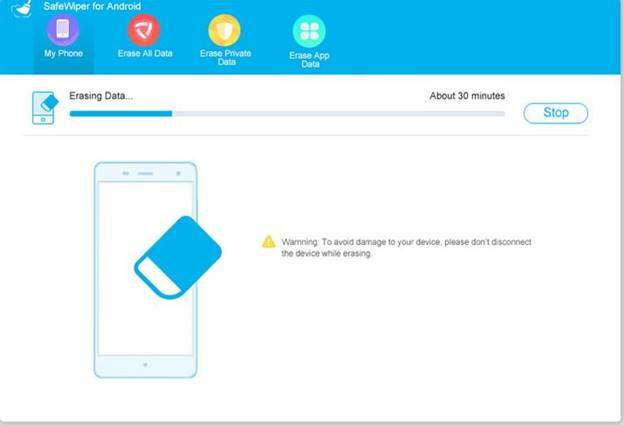 In the recovery mode, the screen will be displayed with few list of options from which you have to select “Wipe Data/ Factory Reset” option and press the “Home” button to select the option. Everything will be deleted from your device and your phone will be restarted to apply for the change. 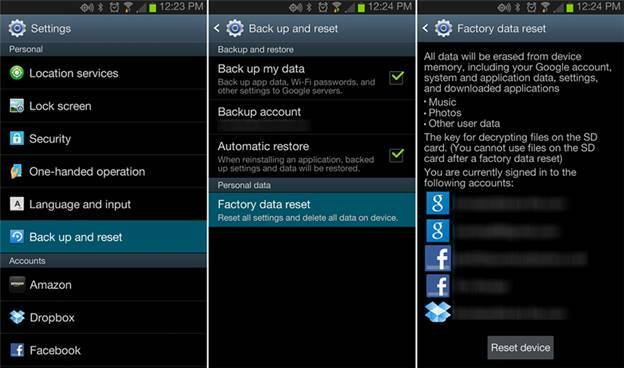 The erase data can be restored using certain recovery tools. Along with deleting your personal data, it will also delete your contacts details which might turn out to be troublesome while calling your friends and family members. Step 1. Press the “Menu” and then “Settings” app. You can also swipe down the screen from the top and tap on the “gear” icon to open the settings app. Step 2. Find out the “Personal” tab and tap on “Backup & Reset” option. If you are asked to enter the PIN or Password, input it to enter the factory reset authentication. Step 3. 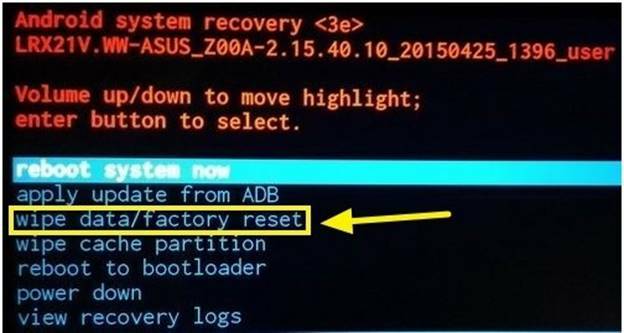 Now tap on “Factory Data Reset”. Step 4. A whole bunch of data will be shown on the screen. Choose what you want to delete and then tap on “Reset Device” to eventually delete the chosen files. The deleted data can be recovered so you are still at the risk of data misuse. Along with your personal data, your contact details will also be deleted which will be problematic while calling. If you are looking for the perfect needle in the haystack of so many options, then Safewiper would be the best option to follow up. 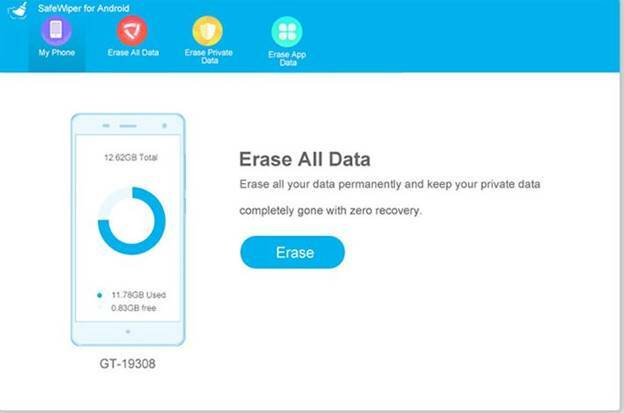 It is one of the secured data erasing tool which can erase your data from your device with no scope of retrieving the data again with any kind of technical skills. It works with all the Windows OS versions, namely XP/ Vista/ 7/ 8/ 10. It is compatible with Mac OS also. No internet connection is mandatory while pursuing the deletion procedure. It removes all types of data, be it messages, applications, media files, contact lists, etc. 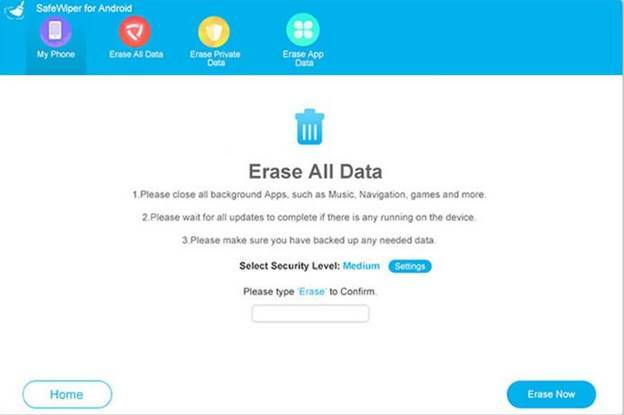 It works with 3 different deletion modes- Erase All Data, Erase Private Data, Erase App Data. Step 1. Get the program downloaded the and install it thoroughly. Step 2. Launch it by right-clicking on the icon and selecting “Run as administrator” and connect your Android device to your computer using a USB cable. Step 4. Now select the “Erase All Data” mode of operation from the UI screen. Step 5. From the following page click on “Erase Now” option to commence the process of deletion. Step 6. The deletion process would take some time to finish. And once it is done your device will be as new as ever. The above article has given you clear hint that out of the all the three mentioned methods, the implementation of Safewiper tool would be the most appropriate tool to put to use. It has got no downsides like the first two methods, thus can be fully trusted in terms of the guaranteed result. Moreover, it has been tested with various brands of computers and laptops which gives an impetus to its reliability. For any further information regarding the tool and data deletion procedures, visit website from time to time to get daily updates.